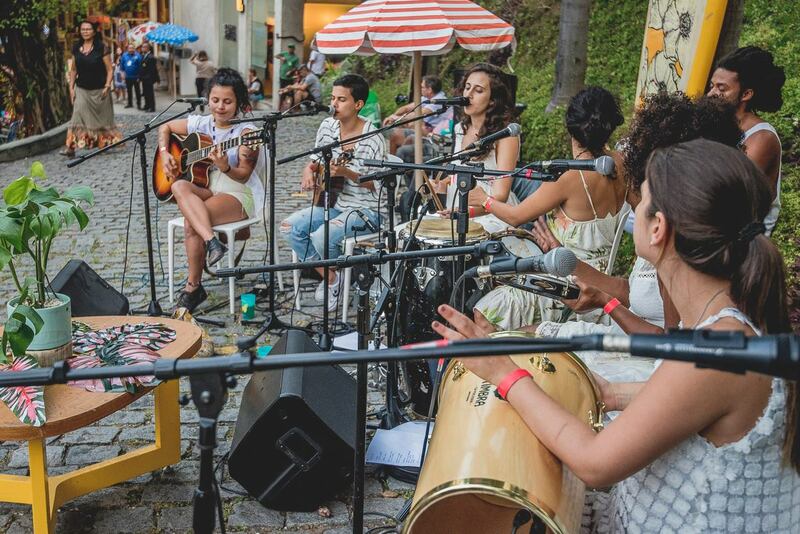 The all-female group ‘Samba Que Elas Querem’ (roughly translated as ‘Samba that they, the women, want’) have had a busy year, playing all across Rio and gaining many fans and supporters along the way, with their timely celebration of women in samba. RIO DE JANEIRO, BRAZIL – This Thursday (August 16th) at 6PM, the all-female samba roda (samba circle) ‘Samba Que Elas Querem’ celebrate their one-year anniversary with a free performance on the streets of central Rio, at Banca do André, Rua Pedro Lessa, next to Avenida Rio Branco in Cinelândia. 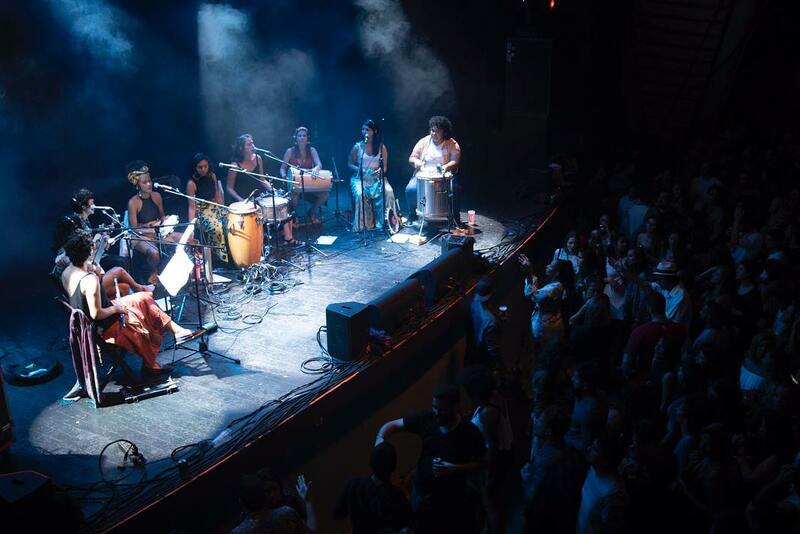 Samba Que Elas Querem are currently composed of Angélica Marino, Bárbara Fernandes, Cecília Cruz, Duda Bouhid, Giselle Sorriso, Isabela Ciavatta, Júlia Ribeiro, Karina Neves, Mariana Solis and Silvia Duffrayer, photo internet reproduction. The groups rallying call has always been, ‘Lugar de mulher é onde ela quiser!’ (The woman’s place is where she wants!) and they have certainly spent a year making true of this statement, performing at events and concerts all over Rio. Samba Que Elas Querem first received attention for their participation in the free cultural festival, ‘O Passeio É Público’ (The Passeio is Public) in August of last year. They then made impressive appearances at Black Awareness Day, and when they performed at Ganjah Lapa as part of International Women’s Day. Since then they have taken part in a celebration of the ‘spirit of samba’ as part of the launch of Museu de Arte’s popular exhibition on the history of samba; and just this past weekend they performed as part of a weekend festival of music and beer at Rio’s Lagoa. This March, they were even featured on national television, as part of ‘Sem Censura’ (Uncensored) broadcast on TV Brasil. During the broadcast, Silvia Duffrayer, spokeswoman for the group, shares her surprise at how successful the group is becoming in Rio de Janeiro. “During the first ‘roda’ the audience was excited, then during the second one there were already a thousand people. In the third the street was crowded and nobody could pass.” She comments. Duffrayer also comments about feminism and what it can achieve with its growing popularity, “We are in a process of transformation, we do not tolerate more things like what we used to hear. We live in a macho world, but it is changing.” She says. Samba Que Elas Querem have gained rave reviews and many followers for their spirited interpretation of the great female samba composers and performers throughout history, including Dona Ivone and Elza Soares, photo internet reproduction. For those attending, prepare to hear some powerful renditions of samba classics by the iconic women of Brazil, such as Jovelina Pérola Negra, Clara Nunes, Elza Soares and Dona Ivone Lara. However, the ladies also include some excellent renditions and reinventions of songs by Paulinho da Viola, Dorival Caymmi, Toninho Geraes, Cartola, Fundo de Quintal and Paulo César Pinheiro. This is going to be fun and passionate celebration of Brazilian music past and present: a reinterpretation and celebration of the neglected history of Brazil’s samba heroines by some modern-day renegades. Anyone who enjoyed the Museu de Arte’s samba exhibition or attended the ‘Rio de Maio’ samba festival is bound to be in for a good time.